UPDATE: There is now a revised (2018) Code of Welfare and this evokes and replaces the Animal Welfare (Llamas and Alpacas) Code of Welfare 2013. 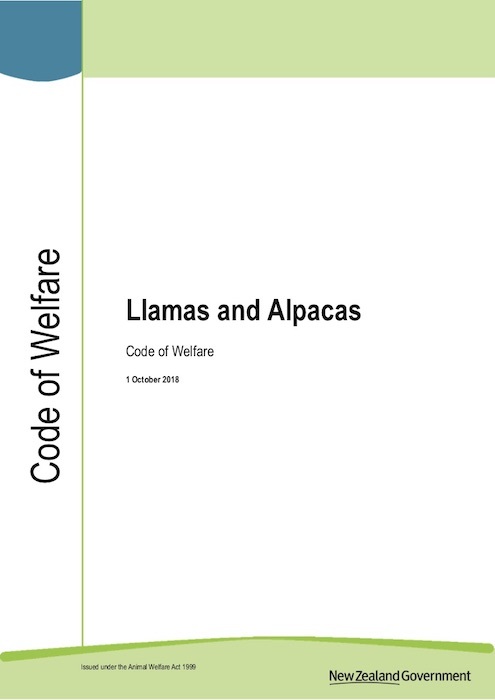 The Animal Welfare (Llamas and Alpacas) Code of Welfare 2013, was issued by the Minister for Primary Industries, Nathan Guy, Friday, 26 April 2013. The code has been developed by the National Animal Welfare Advisory Committee (NAWAC) and establishes how the welfare of camelids is properly and best attended to, and encourages all those responsible for camelids to adopt best practices of husbandry, care and handling. The draft code of welfare applies to any South American camelid (llamas, alpacas, guanaco and crossbreds of these) kept for any purpose in New Zealand. The minimum standards in the code relate to all aspects of llama and alpaca ownership and care including food, water, shelter, behaviour and socialising. The code also provides recommendations for best practice in camelid husbandry and handling which, if followed, will lead to better animal welfare outcomes. Below, and for the record, is the process that was engaged in to get the Code of Welfare Final Draft submitted to National Animal Welfare Advisory Committee (NAWAC). What is a Code of Welfare? promote best practice for people owning or looking after animals. The codes outline the basic level of animal management and care required, but are flexible enough to be modified and improved as community expectations, scientific knowledge and technical advances allow. There are a number of codes covering other species. Presently there isn’t one specifically covering camelids. A code of welfare is the single most important tool used by the SPCA and MAF when investigating cases of abuse or neglect. Upon completion, codes are signed off by a Minister to become law, and helps define whether the authorities can prosecute. For example, it seems no coincidence that the new cat code of welfare became law on a Friday, and the very next Monday SPCA & MAF combined to raid a property in Woodville to rescue many, many cats, along with numerous dogs. Recommended best practices in the codes are not legally binding. But minimum standards are – failing to meet a minimum standard can support a prosecution under the Animal Welfare Act 1999. Similarly, evidence of meeting or exceeding minimum standards can be used as a defence against prosecution. Anyone can draft a code of welfare. It must then be submitted to the National Animal Welfare Advisory Committee (NAWAC) for consideration and public consultation. NAWAC considers public submissions then decides whether to recommend the code to the Minister of Agriculture, to be issued. Creation of a NZ Camelid Code of Welfare. Back in February Penny King lodged an 11th hour application to the Sustainable Farming Fund on behalf of the NZ Llama Association, requesting $7,500 over two years, from a projected budget of $9,500, to help the development of a Llama code of conduct. What is the Sustainable Farming Fund? The purpose of the Sustainable Farming Fund is to support projects that will contribute to improving the financial and environmental performance of the land-based productive sectors. The Fund aims to help the land based sectors solve problems and take up opportunities to overcome barriers to economic, social and environmental viability. It will do this by bringing together “communities of interest”. These are groups of people drawn together by a shared problem and/or opportunity in the sustainable use of resources. 222 applications were received for funds of over $30 million. A team needs to be drawn together to work with MAF, SPCA and the Alpaca Assn., to draw up a draft code for submission. People can contact the MAF Hotline or their local SPCA about any species as they are all covered by the general Animal Welfare Act. Team Two where possible to include representatives of a prominent animal welfare organisation (such as the SPCA, WSPA). Representatives of MAF, the Royal Agricultural Society, A Veterinarian, plus if appropriate of parties with interest in the production of a Code of Welfare for Llamas. Team One : Complete initial draft of New Zealand Code of Welfare for Llamas. Team One: Circulate Initial draft to all known llama owners. (182 names and addresses) plus provide easy mechanism for comments and suggestions. Team Two: Provide an online (chatroom or similar) facility for the discussion of draft document. Team Two: Participate in all communication on comments and suggestions. Table at NZLA AGM and if it is supported by 50% or great of the vote, propose to MAF that this document be adopted as New Zealand’s Code of Welfare for Llamas. Distribute to all Animal Welfare organisations in NZ, provide to Camelid branch of the New Zealand Veterinarian Association. Provide to all organisations represented on Team two. Make publicly available online at no charge. There is no planned use of paid expertise. Team Two will be selected based on the ability to contribute specialist knowledge, be that of other codes of welfare and their application, llamas , veterinarian expertise and experience of farming in a variety of NZ conditions and locations.